Who doesn’t love a black cockatoo - especially in a teacup. This gorgeous card is by Renee Treml and you can find her sweet illustrations on prints, ceramics, Christmas decorations, and children's books too - Renee is also a renowned and multi award-winning author/illustrator! It would make such a big difference to our local design community if we bought even one or two local cards this year to support Aussie artists. You can even frame them after the holiday season! These carbon-neutral 120mm x 120mm notecards are printed in Melbourne on 100% post-consumer recycled paper using vegetable-based inks. 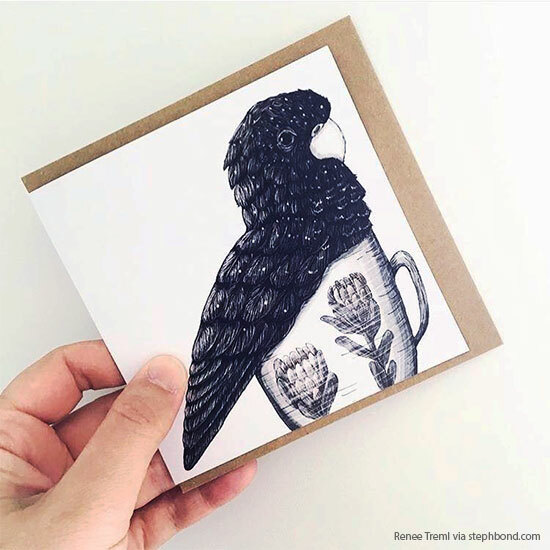 You can snap up one of Renee's cards, prints, books and more at the Big Design Market next weekend in Melbourne or purchase directly from Renee in her online store.